So after a busy few weeks the Box-File is complete. This is one of those stages of building a model railway where everything comes together, and it appears that a lot of progress has been made in a short space of time, in reality the preparation and painting of the details has been ongoing for a couple of months. I'll do painting in batches two or three evenings at a time, but then need to do something different or I'll go potty! The details are mostly from Duncan Models and Phoenix, and have been picked to be in keeping with the farmyard/estate setting. I've tried not to get carried away, although to be honest the scene is a little crowded, hardly surprising given the size of the layout! This 7mm scale is still bigger than I am used to ... anyway such a small layout needs visual interest, and I think the balance is about right. I'm very pleased with the end result of Landswood Park Farm, especially given that it was entirely built within 9 months, including track, scratch-built buildings, and of course the loco and all the stock. It was my first exercise in building my own track, just as well it is buried in the cobbles! Indeed it is my first ever venture into 7mm scale, so despite it's tiny size this layout has provided plenty of challenges and interest, and best of all, fun. The farmyard is now being "dressed" with the details that will make it appear to be a working farm. In the era in which the farm railway would have been used (up until the early '50s at the latest) coal would have been important to the working and domestic needs of the farm, such as household fire places, the blacksmith, the dairy, and steam traction engines. More obvious materials found in a farmyard are straw, and of course manure. Coal is best modelled using ... real coal! I liberated some from my parent's bunker and smashed it up with a hammer until about the right size - old photos show lumps of coal that are surprisingly large, so not too small. A pile has been created by the tracks in the yard, probably the dairy is just off-scene. Manure is simply paster (filler) mixed up really thick and lumpy, with powder paints added for the colour. This was splodged around the animal pens, and a big pile added outside the barn waiting to be loaded into a skip and taken to a field! Straw is mixed in using long static grass in a suitable shade of yellow. The photo above shows that I have disguised the end of the layout with a gate behind the barn, and a lean-to the other side containing the stocks of straw (or is it hay?). The barn has a pen inside. I've used more coffee stirrers for these. At the other end of the layout I have made another pen, this time using cocktail sticks and "chicken wire". You know those balls of netting that women have in the shower? I've no idea what they are for, but my wife's has a bit missing! It has always been my intention that the rolling stock is very much part of the layout, so some of the wagons are recieving loads of the same materials (and traces of them when empty). The skips have plasticard false-floors, which in this picture are having the manure or coal added. The cling-film is to stop the loads sticking into the wagons, hopefully they will be a removable snug fit. I'm not sure what the correct collective noun for a group of wagons is, but anyway I've finally completed the 11 you see here, which should be sufficient for Landswood Park. They are all KB Scale kits and based on the Hudson "Rugga" Skip, but using some of the KB Scale variations (including brake ends) plus my own interpretations I've made a variety of different wagons. My intention is to use different loads too, so they all look different, having visual interest in the wagon fleet is important to such a small layout, and is one of the reasons I chose a farmyard as a subject for the model. I painted all the wagons as a batch, starting with Halfords Red Oxide primer as an undercoat (all wheels, couplings etc. removed and blue-tak in the bearings). I used a trick I hear of for rust, spraying them with water and liberally sprinkling salt over them. Once dried they were sprayed with Humbrol matt black (aerosol can), then rubbed until the paint came away from the salted areas. Although not quite as effective as I'd hoped it did reveal patches of red oxide and peeling black paint. A couple of washes of rusty brown to tone down the red oxide and dirty the black, plus a dusting of weathering powders and a spray of Testors Dullcode matt varnish finished the job. Woodwork was washes of grey/brown and the barrels picked out in militay-ish green, they must be MOD surpless! The photo below could have better lighting, but hopefully shows the effect, which I am quite proud of. These wagons are little bigger than those I am used to building in 009, and being plastic are quite light, so I have packed them with as much lead (old roofing offcuts) as possible. This is easy for the flat and open wagons, having a useful floor, and I did remember to put some lead in the barrels, but open skip chassis have had to have strips of lead put under the centre and end bracing bars. A strip is also added to the bottom of the V skips too, which I hope to be able to hide. Wheels popped back into place, couplings fitted and adjusted, V skips held in place with a dab of PVA, and they are ready to go. Apart from those loads of course ...! As the layout nears completion it is time for a quick tidy up of it's external appearance. Now the rules of the competition dictate that the box-file lid must close, but in any case I wanted the layout to still be a box-file externally when closed up. In other words, to look as much like a normal box-file as possible and be able to be stored as one. Since I am going to the trouble and compromise of building the layout in a box-file, it seems to me to defeat the point were it to loose those characteristics. However the outside of the box was starting to look a bit tatty and "butchered". Amazingly I found a matt-black emulsion paint test-pot (Crown "rebel") at my local DIY store (presumably for the Goths, but why would you need a test-pot to see what black looks like?!). All the exposed chipboard of the box sides where it has been cut had already been sealed and smoothed with PVA glue. So the edges, and any other exposed card areas, or marked external surfaces, were touched-up with the black. Other than the two holes in one end for the tracks, the main modification to the box was to cut out a section of the front. I've kept this to re-fit, using some small hinges obtained from Squires. The hinges are super-glued to the box and then track-pins pushed into pre-drilled holes via the holes in the hinge plates. The lid catch still works, the hinged front now makes the closed box much stronger. I need somewhere to store the buildings, end-panels, extension track, and stock for this layout, so what better than a second box-file? I've been using one to store all the bits of the project, but to protect the contents I have used some cereal packet card to organise it. The backscene end panels slot inside the lid, the extension track along the back edge, and a set of "egg-box" partitions protect the wagons. The trouble is there isn't space for the tops of the buildings so I will need to re-organise, I'm sure they should fit in somehow! Well there are now leaves on the trees anyway! As you can see from the picture I've had a tree foliage session. The tree in the polystyrene block on the left is the wire-trunk one I made for Landswood Park, the rest are for Awngate. The two in front in cork bases are based on whitemetal trunk/branch armatures from Realistic Modelling Services, the other smaller trees in the polystyrene block are based on plastic trunk mouldings picked up for a few pence at an exhibition. Given a lick of paint to take away the shiny plastic look, and with foliage matting stretched over the outside, the effect is quite good considering the little effort involved! Foliage is the matting type, I had some Heiki and some Woodland Scenics, which is teased out and either stuck accross the branches (in the case of the large tree), or just stretched over the outer branches like a tent. The second method was much quicker and just as effective for smaller trees! The branches were coated with PVA glue first, and after the main foliage was in place a spray of glue (or hairspray) was applied, and any left over foliage scattered over the top, ensuring no bare areas. The big tree fitted in place on Landswood Park, it adds to the rural feel, helps hide the hinge in the backscene (lid), and disguises the fact that the buildings are low-relief. It is actually a "low-relief" tree, he long trunk slots into the plasticard "pocket" fixed to the back of the box-file, which has now been hidden by a short fence made from coffee stirrers. The buildings have now been fixed in place with PVA, the joins where they slot into the ground have had a little excess glue applied and some static-grass applied with a Noch puffer bottle. It hasn't stuck up as much as I expected, it's the first time I have used it and perhaps it will work better on a flat area. This is really coming together now, I have been gradually making and painting up detail items which are about ready to be added. I also need to have a tree-planting session on Awngate! I spent the day at the Goodwood Revival today. It's a classic car race meeting at a race track dating from 1948, however it is far more than a gathering of enthusiasts. Everything is in period style - from the race cars, air display, stewards and marshals, even the burger vans! The atmosphere is what makes this event, and a great day out ... apart from a touch of sunburn! I've been doing some painting, including the cobbles of the farmyard. I used thinned enamels, as I was worried that water-based paint would dissolve the DAS clay - it probably wouldn't. I started with a dark grey, which took a lot of paint to cover well into all the cracks. Then I applied coats of lighter grey/browns over the tops of the stones to try and match the photos of Tatton Park farm. The "metal" plating over the points was given that rusty dark brown colour that manhole covers go. After checking that the track still worked and a loco would traverse it (and after fettling with a screwdriver to clear any excess paint and clay from the rail head and sides), the whole lot was given a final, well-thinned wash of muddy brown. The result is delightfully uneven and looks about right to me. Not sure that the photo shows the colours right though, the back of the layout looks darker which must be a combination of shadow and a mix of the tungsten room light and flourescent layout lamp! Here's a photo of Tatton Park Farm, which shows the ground effect I was after, and I think reasonably achieved. A load of old cobbles! 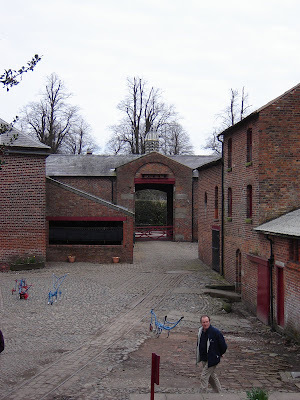 And so to a job I have been thinking about for a while - laying the cobbles in the farmyard. As this covers the entire ground of the layout, including the track, it is pretty critical to the look and operation of the layout to get it right! Now I have read on the NGRM Forum and also Chris Nevard's Brewhouse Quay of using DAS clay for inset track. I last used DAS as a teenager for stone buildings but never got the stonework looking right, but that was some time ago so why not give it another go? First as you will have seen previously the area between the tracks was covered in thick card up to sleeper height, then any gaps between the sleepers were levelled with small pieces of clay. I wanted to cover right up to the buildings, but didn't want to get them messed up, so gave them all a "skirt" of paper. This may not have been necessary as no doubt the clay could have been wiped off, but remember some of them need to be removable. Then the clay was rolled out to a thickness of about 1.5-2mm, cut to approximate shape (some paper templates were used), and laid onto a layer of PVA. The idea was to have the ground surface just below rail height, so as not to lift wheels off the track and to allow the rail head to be cleaned. The picture above shows the clay being laid, that between the tracks in the centre has just been smoothed into place and is having the flange-ways opened out. 014 standards a fine-scale so the flange-ways are mercifully small, especially having been so used to 009! The dark clay beyond has just been laid and embossed with setts, while the lighter clay to the right has already dried. There you can see a mixture of setts (mostly around the rails and doorways) and cobbles, exactly as I saw at Tatton and something I wanted to reproduce. Cobbles help with the rural farmyard feel, setts throughout would have felt more industrial to my mind. I embossed the clay whilst damp using a variety of home-made tools, shown above. On the left is a flat piece of plasticard with handle, sized to fit between the rails, used for smoothing and levelling the clay. Next is another one with slots for the rails, and ridges for the flange-ways. The black one is also for clearing flange-ways to the right depth. In the centre is a square-section plastic tube, and next to it a block of three, with chamfered ends used to emboss the setts. These work out about a scale 7 inches square, probably a little too big but that's what I had to hand. On the right is a round tube, and a block of 7, also with chamfered ends. These were used for the cobbles, at about 3 inches scale size they are probably about right. Embossing in this way was relatively easy, and gave a good result - but not too even. Even so, it took me three (long) evenings to complete this scene, only about the size of a sheet of A4 paper! I think it was worth it, the scene is really coming together now. Next up, painting it. And let's hope the track still works at the end of it. We had a family day out today, to Paultons Park featuring Pepper Pig World. Those of you that don't have pre-school kids won't know how big Peppa Pig is to the under-5's. Suffice to say I don't think the kids would have been more excited had it been Christmas when we told them! That was not the only train ride either, we had to take Grandpa Pig's train too!